The P.A.T.T.I.-K® instrument and method conforms to ASTM D 4541: "Pull-Off Strength of Coatings Using Portable Adhesion Testers" and is classified as a Type IV instrument. No Conversion Charts needed for the most popular configurations! F-2, F-4 and F-8 models with 1/2" stubs available. The self-aligning P.A.T.T.I.-K® quantitatively measures the adhesion strength of numerous coatings, including: paints, polymers, ceramics, inks, films, adhesives, and thermal or arc-sprayed metals. The test surface can be smooth, rough, porous, flat or curved (please contact us for application specific solutions). Custom-machined pull-stubs are available at any size, either flat or with a radius to match curved surfaces. 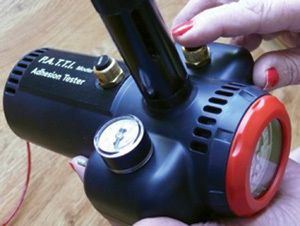 The P.A.T.T.I.-K® can also be used to test the strength of adhesives under non-room environmental conditions from 32-212 degrees Fahrenheit ( 0 - 100 degrees Celsius). The P.A.T.T.I.-K® uses compressed inert gas to apply a continuous tensile load to an aluminum pullstub which is bonded to the test surface with an adhesive. After the adhesive has cured, the operator attaches the piston. Then the operator pushes and holds the "RUN" button. A continuous load is then applied perpendicular to the pull-stub until failure occurs, or until a specified load is reached. 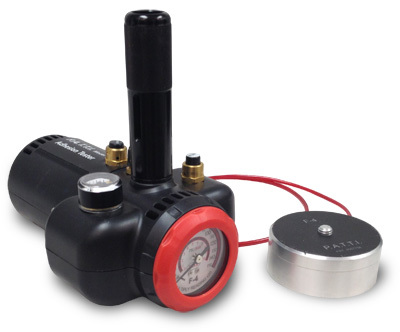 The P.A.T.T.I.-K® can be pressurized with CO2 cartridges to make it portable for field use. In the laboratory, nitrogen or any clean inert gas system providing at least 100 psig (up to 160 psig) can be used. The P.A.T.T.I.-K® features a patented piston design which assures uniaxial alignment with the pull-stub axis for "true tensile testing". 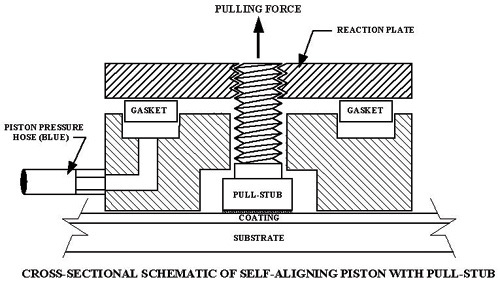 There is a different piston for each load range shown in the table below. It is recommended that you choose the piston whose midpoint testing range is closest to the suspected tensile strength of your coating. For instance, suppose that your coating has a tensile strength near 1000 psi. You would choose the F-2 piston option. Although the F-8 piston could test a coating in this range, it would be on the lower end of the range of the F-8. At least 100 psig supply pressure (up to 150 psig) is required. All pistons are self-aligning. Power Options: N/A N/A 9V batt. or AC adap. 9V batt. or AC adap., USB 9V batt. or AC adap. Analog Laboratory/Field control module, one single load range piston (F-2, F-4 or F-8), transport carry bag, accessory kit (50 pull-stubs, 50 adhesive masks, epoxy kit 907, 6 CO2 cartridges and instruction manual.